The latest battle over expiring Air Miles prompted Robb Engen to call for a law banning loyalty point expiration similar to the ban on gift cards and pre-paid cards. This is sensible in that it removes one method loyalty point programs have to devalue points. However, it doesn’t solve the whole problem because there are many other methods. The most obvious way to devalue points is the slowly increase the number of points it takes to get rewards. Aeroplan has been doing this for years with their miles. Another commonly-used way to devalue points is to place arbitrary restrictions on when points can be redeemed. Clever businesspeople can certainly find other inventive ways to reduce their liability once the number of points they give out swells. One explosive way would be to set up a corporate structure so that the liability rests with a corporation starved for cash that goes bankrupt. This is similar to the way fitness clubs used to renege on multi-year pre-paid memberships. An important way to protect yourself is to not let loyalty points change the way you shop. Spending money you wouldn’t have spent otherwise to collect more points is throwing away dollars to get back pennies. And once you have some points, if you wouldn’t have bought a Santa cuckoo clock for cash, then you’re not getting ahead buying one with points. Loyalty point program rely on the fact that we get excited about seemingly free stuff without ever doing the math, or accounting for future changes in rules. But you can count on the fact that companies offering loyalty points are doing the math. We can try to justify taking on a huge mortgage by doing detailed projections of house price increases and accounting for various housing costs, but this isn’t the path to a useful answer. It’s unexpected factors that drive this decision. One factor that many don’t properly take into account is repair costs. We all know the furnace, roof, and other expensive items will need replacing, but we usually can’t predict when. This makes it easy to ignore such infrequent large costs in a budget. Some inexperienced homeowners may even forget about predictable costs like property taxes, house insurance, and condo fees. Another category of unexpected factors is reduced income. If you buy a house with a spouse right up to your joint affordability limit, any reduction in income can be devastating. We’ve all been told that we could lose our jobs, but in my experience, most people don’t think this will happen to them, even though it’s common. You may believe you could lose your job, but that you’d find another one easily enough. It’s very common for people losing their jobs to end up with a lower-paying job. Getting forced into permanently lower pay can happen to anyone, but is common for those over 50. Health problems are another common reason your family income can drop. You may not be able to work at all or have to get a lower-paying job. Health issues are a common reason why some people are forced to retire before they want to. Another factor younger people tend not to think about is that you may want to do something new later in life. If we could stop people on their commute to work and get them to answer honestly how they feel about their jobs, an alarming number of them would say they dread going to work and feel desperate and hopeless. They are trapped in their jobs by debt. They yearn to do something else, but that something else likely pays less money, at least for the first few years. We can push all these worries aside by just leaving a healthy gap between the size of mortgage you take on and the size of mortgage a lender will let you have. Don’t give up future flexibility for an expensive house. Donald Trump’s electoral victory came in part because he appealed to Americans who feel left behind in the modern economy. These people seem to believe Trump will improve their financial prospects. With this in mind, I’ll be watching for policy changes that affect American taxpayers and retail investors. Two in particular are a fiduciary rule and bank leverage. When brokers and other financial salespeople sell investments to the American public, mostly for their retirement accounts, they are allowed to sell grossly over-priced investments. The high fees can consume one-third to one-half of an investor’s savings over an investing lifetime (these fees are typically even higher in Canada). The Department of Labor has been moving toward a fiduciary rule, which means the salespeople would have to put their clients’ interests ahead of their own and choose lower-priced investments. We’ll see if this rule gets abandoned now that Trump has been elected. If banks never borrowed money, their profit margins would be very slim. To make banks profitable, they borrow enormous sums of money. The amount they borrow is much more than the assets they hold. When the ratio is ten to one, profits and losses are magnified by a factor of ten. This ratio is often called the “capital-to-assets ratio.” When times are good, banks make good profits that enrich their owners and top management. If times are bad enough, such as during the 2008-2009 U.S. housing crash, banks can’t pay back their loans, and taxpayers bail them out. For bank management, it’s a case of “heads, I win”, and “tails, taxpayers lose.” This creates what is known as a moral hazard because banks have an incentive to take big risks. To combat this problem, U.S. laws such as Dodd-Frank and the Volcker rule are in place to limit leverage, which reduces the odds of banks being unable to pay their debts and protects taxpayers. However, these rules also limit bank profits and executive bonuses. It will be interesting to see what happens to these rules in a Trump presidency. These are just two of the things that will test how serious Trump is about helping typical American people rather than helping the rich. Let’s start with a minor problem. Brown thinks he knows how banks should run their business better than they do. This is ridiculous. If his simple ideas for encouraging students to avoid debt and interest were profitable, the banks would already be using them. The truth is that hooking students on credit cards is profitable on multiple levels. For one, students rarely default because their parents usually pay if necessary. For another, setting a pattern of high-interest debt makes people more profitable to banks later in life. The bigger problem is the presumption that banks care at all what’s in their customers’ best interests. Many of us would like to believe we’re all in this world trying to help each other. But that’s just not true. What keeps any business in line is the threat of unhappy customers either leaving or demanding new laws to control the business’s behaviour. Brown’s ideas might make some sense if he suggested creating new laws to force banks to help students. But the idea that banks would voluntarily turn away profits makes little sense. Canadian Couch Potato has been running a long series about smart beta that ends with this post summing up his opinions. His fans who feared he’d gone to the dark side can rest easy. I appreciate his approach of keeping an open mind when looking into new ideas. We can’t learn anything new if we automatically reject all new ideas. I would never have taken up index investing if I hadn’t given it a chance. Although it seems unlikely I will make significant changes to my investing approach in the future, I won’t rule it out. One could argue that I have taken a small step toward smart beta by owning VBR (Vanguard’s U.S. small cap value ETF). However, nothing I’ve seen about smart beta has persuaded me to go any further than this. Barry Ritholtz quotes Bill Miller saying that the shift from active to passive investing isn’t what it seems. The real shift is from expensive closet indexers to low-cost indexing. The Blunt Bean Counter explains important changes to the Principal Residence Exemption (PRE) for capital gains on your home or cottage. Under the new rules, it is important to declare home sales on your taxes, even if you don’t have to pay any extra taxes. Based on my experience trying to explain such things to non-experts, I predict that many people will decide that these complications don’t apply to them and they will ignore it. In many cases, ignoring these new rules will end expensively. Canadian Portfolio Manager has begun a series of video tutorials explaining the mechanics of setting up an ETF portfolio at discount brokers (including screenshots). This video is for BMO Investorline. Be sure to read the article as well because it describes some minor slip-ups made in the video. Tom Bradley at Steadyhand says that a TV show about sensible investing would be “the worst TV show ever.” I’m pretty sure I’d watch at least one episode. Preet Banerjee interviews accountant Mark Goodfield, a.k.a. The Blunt Bean Counter. Big Cajun Man managed to get a trading account transferred from TD to Questrade in only 10 days. Boomer and Echo say the Feds aren’t killing the housing market. My Own Advisor is thinking about minimalism to reduce clutter, costs, and other things that distract from the things we truly enjoy in life. Million Dollar Journey describes the experience of transferring a defined-contribution pension from a former employer to a self-directed Locked-in Retirement Account (LIRA). Ben Carlson wrote an interesting piece called Faulty Wall Street Assumptions where he goes through some misguided ideas financial professionals perpetuate about the way to investment success. What Carlson understands well, but may not show through to his readers is that it isn’t the financial professionals on Wall Street and elsewhere who are misguided. They are exploiting our faulty assumptions. Investors like you and me are making the mistakes. Let’s go through most of Carlson’s list of faulty assumptions and look at why financial professionals behave the way they do. Investing is about finding new opportunities and security selection. The very best investors with superior access to company information may be able do well looking for new ideas, but retail investors just jump from one dashed hope to the next. Click-bait screams “5 NEW INVESTMENT IDEAS!” to exploit our weakness. Why would anyone go to the trouble of finding great new hidden gems and then give them away to us? We may get fooled, but those who peddle “exclusive opportunities” know what they’re doing. A 200-page prospectus is a good idea. When advisors give you long account statements and massive documents about new investments, they want you to ignore them. They want you to just trust them instead of trying to understand what you are buying. Most investments amount to a mix of stocks and bonds that can be explained simply. Demand an understanding of what you’re buying. Clients want to be impressed. I think Carlson got this one a little muddled. He paints a picture of misguided advisors working against their own interests and those of their clients. It’s true that clients may be best off if their advisors don’t try to impress them. Unfortunately, advisors will make more money over time if impressing clients is part of their strategy. The onus is on clients to be impressed by simplicity and clarity instead of being impressed when they get baffled. Many advisors sell expensive investments by walking a fine line between offering simple-sounding stories and using complexity when clients try to dig into the simple stories. People care about risk-adjusted returns. Carlson is spot-on with this one. Clients don’t care about the textbook concepts that advisors need to understand to do their jobs well. Intelligence is all that matters. You have to have an opinion about everything. In social settings, I hear friends ask financial guys all sorts of impossible-to-answer questions like “will interest rates go up?” and “will Apple stock tank?” The financial guys always have a smart-sounding response, even if they don’t really answer the question. It’s in their best interests to behave this way. It would be better if people understood that nobody knows the answer to these questions, but that’s not the world we live in. Once again, the onus is on clients to understand their advisor’s limits. Self-interest drives advisors to give answers when they don’t really know. An advisor who says “I don’t know” too many times is a former advisor in most cases. It’s true that people “really need is an honest assessment of the current situation and the prospects for the future.” While it may be dishonest to offer certainty, it is profitable. Advisors who subtly give the message “just follow me and you’ll be okay” do well. This is unfortunate, but it is reality. It’s the clients who need to look past this offer of certainty and try to understand what they’re getting. Complex markets require complex solutions. Once again, it’s true that simple solutions are best for the vast majority of investors, but advisors have learned that simplicity usually doesn’t sell. Until clients demand simplicity, expect advisors to convey the message that investing is complex, but that they can handle it for their clients to simplify their clients’ lives. Past performance is all that matters. It’s true that past performance does not guarantee future performance. However, we’re not wired to think that way. Touting past performance is an effective way to sell investments, even if it’s fundamentally dishonest. Advisors who want to actually help their clients will explain the need to avoid chasing recent winners, but expect many advisors to exploit our weaknesses and keep selling past performance. Clients need more choices, more ideas, more products, more portfolio changes, more everything. It’s true that clients don’t need this churn. But churn creates profits for brokers and advisors. There are honest financial professionals who seek to do what’s best for their clients. However, financial incentives are powerful motivators. Even honest people are guilty of motivated reasoning where they find a way to believe that their actions are good for their clients. Further, there are many advisors with minimal training who just do what their employer’s tell them to do and have no real idea of what’s good for their clients. The result is a world where we all have to look out for our own best interests and not just blindly trust others. Imagine you get to play a profitable game. You’re given $25 and get to gamble on the flips of a coin. Whatever amount you wager gets doubled or you lose the wager. The profitable part is that you’re told the coin is biased; heads comes up 60% of the time. After betting for a half hour (enough time for about 300 bets), you get to keep whatever money you have left. Your wagers have to be multiples of a penny, and you’re told there’s a cap on your winnings, but not the amount of the cap. If you bet enough to put you at or over the cap, you’ll be told at that point the amount of the cap. What betting strategy would you use? Victor Haghani and Richard Dewey ran this experiment on 61 “college age students in economics and finance and young professionals at finance firms.” Their very readable working paper is available here. Despite the financial sophistication of the subjects, they didn’t do very well with the betting. The experimenters capped winnings at $250, but only 13 of the subjects got to $200. In fact, 17 of them ended up with less than $2. The most surprising finding to me is that 41 subjects bet on tails at least once, 29 bet on tails more than 5 times, and 13 subjects bet on tails more than one-quarter of the time! An online version of the game is available if you’d like to try it before I give away strategy details. However, they’re not giving away real money any more. Given how poorly the subjects did in this fairly simple game, it’s hard to be optimistic about people making sensible choices in the much more complex world of investing. After reading the game’s rules, my first thought on the correct way to play was to repeatedly bet on heads with a fixed fraction of the current bankroll. 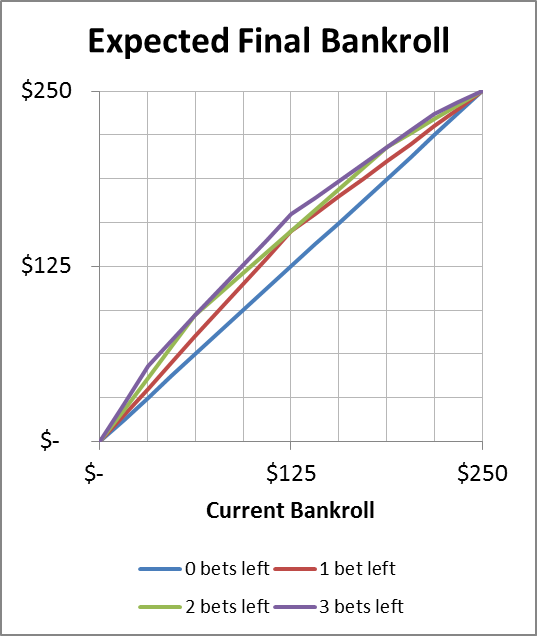 How to choose the fraction of bankroll to bet goes all the way back to Daniel Bernoulli in 1738 who suggested that we should treat money as having logarithmic utility. This may sound complex, but it’s not too difficult. It just means that each doubling of your net worth is equally valuable, and that each new dollar you get is worth a little less than the last dollar. The standard way to derive the correct fraction to bet isn’t very accessible to many readers, but an equivalent way to look at it is easier. Let’s call the betting fraction x. So, if we always bet 15% of the current bankroll, then x=0.15. Your money grows by a factor of 1+x if you win, and 1-x if you lose. After 5 tosses, the median outcome is 3 heads and 2 tails. If you bet on heads each time, this median outcome grows your money by a factor of (1+x)3(1-x)2. If you try different values of x, you’ll find that this expression is largest when x=0.2. This means betting 20% of your money on each coin flip. So, the first bet would be $5, leaving you with either $20 or $30. If you lost, the next bet would be only $4. If you won, the next bet would be $6. After the first bet, because your odds of winning are 60%, your expected bankroll is $26. So, on average, your bankroll grows 4% on each bet. This method of determining the fraction of your money to bet is known as the Kelly Criterion. The two researchers suggest this approach as a good way to play their game. Indeed, it is a good way to play the game, but not optimal. Getting back to the experiment, “average bet size across all subjects was 15% of the bankroll,” which is actually more conservative than the Kelly Criterion. However, betting on tails and erratic bet sizing sunk several subjects. Suppose the subjects knew in advance that the cap on winnings was $250 and knew they’d get exactly 300 bets. Further, let’s assume that $250 is small enough in each subject’s life that we can treat the money as having linear utility (this means each extra dollar won is worth the same as the last dollar won). This doesn’t seem like a huge difference in the game. However, the optimal strategy in this case is very different from what you get with the Kelly Criterion. In fact, the optimal strategy doesn’t even depend on the coin’s bias! The experimenters’ goal was to create an experiment that mimics the properties of investing as closely as possible without costing them too much money. Even this simple experiment put them at risk of losing $250 to 61 subjects, for a total of $15,250. Fortunately, poor play reduced their costs significantly. Unfortunately, the $250 cap on winnings makes optimal play quite different from optimal investing strategies. This means that chastising subjects for betting patterns that differ from the Kelly Criterion can be misguided. No doubt many subjects made bets that can’t be justified, but as I’ll show below, optimal betting doesn’t look much like the Kelly Criterion. The authors’ simulations of strategies based on the Kelly Criterion gave the expected value of the game as “just under $240.” However, when the $250 cap is known, the optimal strategy has an expected outcome of $246.60. I found this result with a method that gave exact results rather than using Monte Carlo simulations. I also used computation methods with large integer values to avoid floating point rounding errors. The general method was to start at the end and work back. 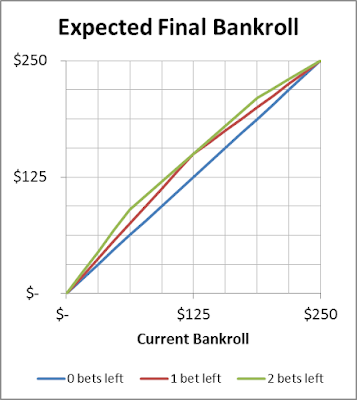 After the last bet, the value of each bankroll amount ($0.00, $0.01, $0.02, ..., $250.00) is just the bankroll amount. (To take into account utility, you could replace these values with their utilities, but that isn’t what I did.) Backing up one bet, we look at every bankroll amount and every possible bet size and choose the bet size that maximizes the expected outcome. 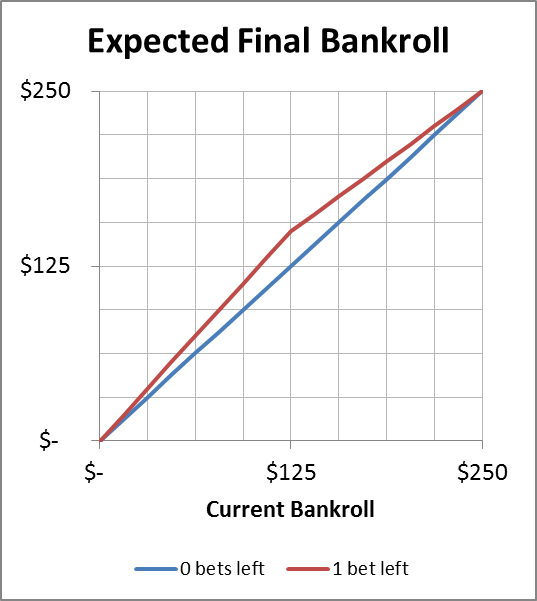 Then the value of each bankroll amount before the last roll is the expected value after the optimal last bet. As an example, if you have $125 before the last bet, your best strategy is to bet it all. This has an expected outcome of $150 because of the coin’s bias. Working through all possible amounts you could have before the last bet, we can find the expected final bankroll given the best bet size. We can then go back to the second to last bet. Continuing this way, we can back up a total of 300 bets. Starting with $25, the expected outcome works out to $246.60. It turns out that this game is actually easier to analyze if we eliminate the restriction that bets be multiples of a penny. The outcome doesn’t change much by removing this restriction. When bets are multiples of a penny, the expected outcome is $246.6063. When fractions of a penny are permitted, the expected outcome is $246.6066, just 3 hundredths of a penny more. It looks like we nailed down the ends of the blue line, grabbed it in the middle, and stretched it up 20% to make the red line. If we then analyze the best bet size on the second to last bet, it turns out that there are often many bet sizes that are equally good. A simple rule that gives one of the optimum bet sizes is to bet the difference between your bankroll and the closest one of $0, $125, or $250. Notice that the middle two segments of the green line have the same slope, so we only have slope changes at $62.50 and $187.50. With 3 bets left, tied for best strategy is to bet the difference between your bankroll and the closest one of $0, $62.50, $187.50, or $250. It’s getting a little harder to see what’s going on, but the purple line has 4 different slopes. The first 1/8 of the way it has slope 1.2*1.2*1.2. The next 3/8 of the way, its slope is 1.2*1.2*0.8. The next 3/8 has slope 1.2*0.8*0.8, and the final 1/8 has slope 0.8*0.8*0.8. 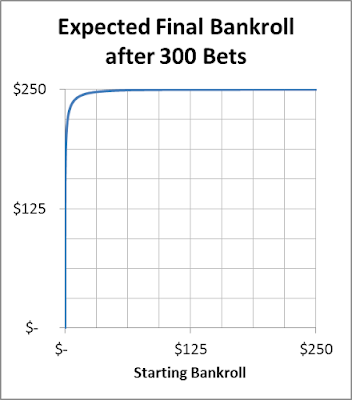 Some readers may recognize that the bankroll gets divided into segments that look suspiciously like Pascal’s triangle, and the expected winnings follow the Binomial distribution. 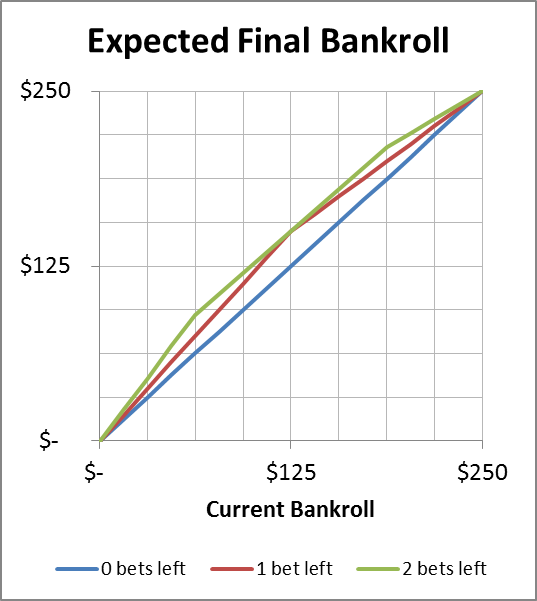 Suppose your bankroll is at at one of the 3 points where the purple line changes slope (bankroll of $0, $31.25, $125, $218.75, or $250). Call these the nailed-down points. Then the optimal strategy is to bet enough to get to one of the nearest nailed down points of the green line. Which nailed down point you get to on the green line depends on whether you win or lose the bet (except if you’re already at $0 or $250). The optimal strategy on the second to last bet will take you to a nearest nailed down point on the red line. This rule works all the way back to the start when you have 300 bets left. If you are ever on a nailed-down point, you just keep jumping to other nailed-down points until finally you end up with nothing or the full $250. 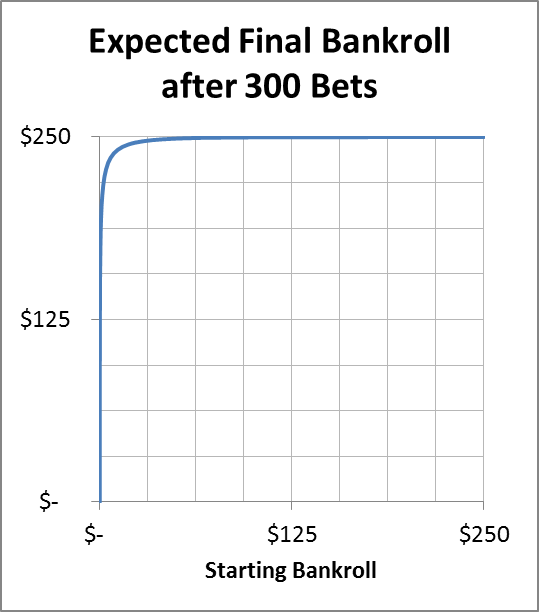 The following chart shows the expected winnings for optimal play with 300 bets left. This is the same chart we would have produced if I had continued the above sequence of charts for 300 steps (except that below I only show the last line and not all that came before it). The blue curve is actually made up of 301 line segments. It shows that optimal play gives the maximum payout of $250 with high probability for all but the smallest starting bankrolls. When you start with $25, the odds are 98.64% that you’ll get the full $250. For the first wager, bet amounts from $1.99 to $3.16 are equally good. However, if we play this game for 10,000 bets, the best starting bet drops to between $0.37 and $0.51. And if we are given only 3 bets, the optimum strategy is to just bet it all 3 times hoping to end up with $200. So, we see that optimum bet sizing can be very different from the Kelly Criterion. As promised earlier, optimal bet sizes don’t even depend on the coin’s bias. In the procedures where we nailed down lines grabbed them in the middle and stretched them up, the coin’s bias affected how high we stretched the lines up, but not the bet sizes. If heads comes up only 55% of the time, the expected winnings drop from $246.60 to $168.56. 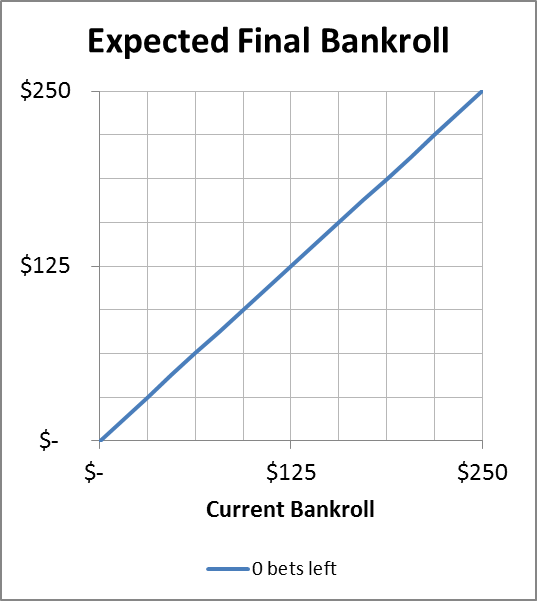 If heads comes up 70% of the time, the expected final bankroll is less than one-millionth of a cent under $250. But the bet sizes don’t change, even though the Kelly Criterion would have you making different bet sizes. Returning to the original games where subjects don’t know the winnings cap, the optimal strategy depends on your opinion of the probability distribution of the winnings cap. However, for any reasonable assumed distribution that would not destroy the experimenters financially, optimal strategies won’t look much like the Kelly Criterion. This doesn’t mean that the Kelly Criterion is wrong in other contexts. It just means that the winnings cap changes this game significantly. We can’t say that subjects are crazy for making bets that don’t agree with the Kelly Criterion. While Kelly-sized bets work reasonably well, there are many other strategies that work well, and some that work better for this game. Probably the biggest challenge for the experimenters is that the amount of money at stake is fairly small compared to the subjects’ other assets, including human capital. This shows up most at the end of the game where is makes sense to make large bets. When you’re handling your actual portfolio, situations where it makes sense to bet it all are highly contrived. These experimenters have done some fascinating research that digs into how people understand investment risk. Despite the fact that the game they designed has limitations that are hard to fix, their results were illuminating, mainly because the subjects performed so poorly. Another conclusion readers can draw is that I enjoy analyzing games and dug further into this one than was necessary to explain the game’s differences from actual investing.